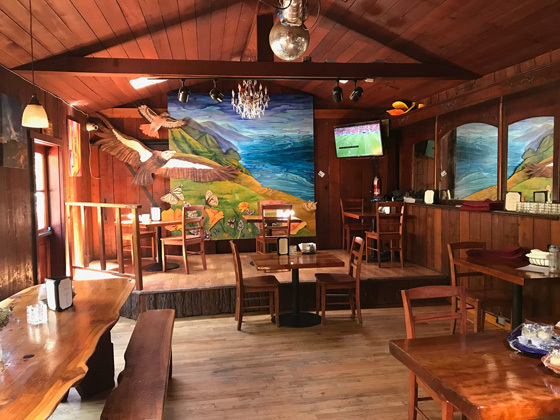 Fernwood's tavern is a popular local watering hole built in the traditional Big Sur style with redwood timbers. Fernwood's homespun atmosphere attracts a variety of locals and tourists, making for some very entertaining evenings. Very popular on evenings when live entertainment is available - usually Saturday night beginning at 9:30 PM. Check the Calendar of Events page to see who'll be playing while you're in town. We also host spring and fall music festivals in the campground. Fernwood Tavern is also a popular lunch and dinner location. The Bar & Grill serves up a variety of great dishes and pizza's to compliment the variety of high quality beer and mixed drinks. As you can see, this is a very relaxed and comfortable atmosphere. We want you to come in and make yourself at home. Have a seat on the couch and watch the big screen televisions - very popular on sports nights. 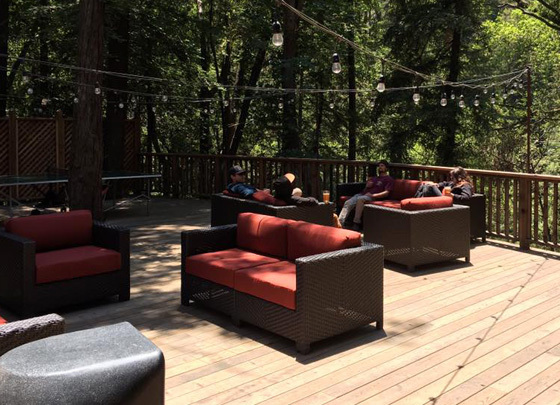 The back deck offers another comfortable setting to eat lunch or just hang out under the enormous redwood trees and relax. 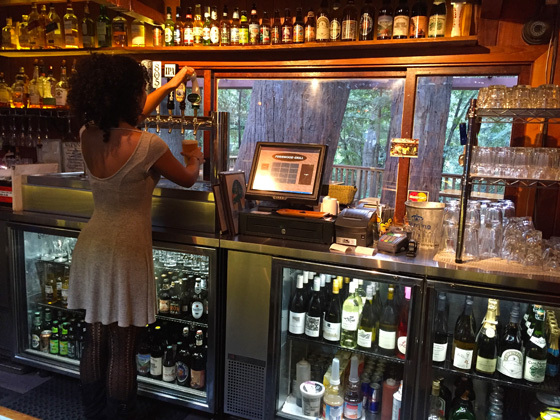 Friendly bartenders to serve up the drink of your choice from our full bar. 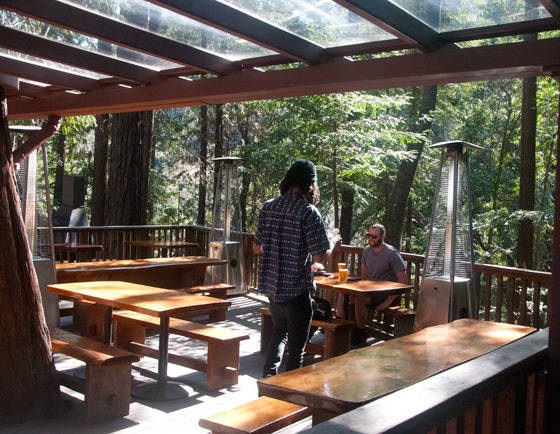 Dining on the back deck under the redwood trees during daylight or evening. 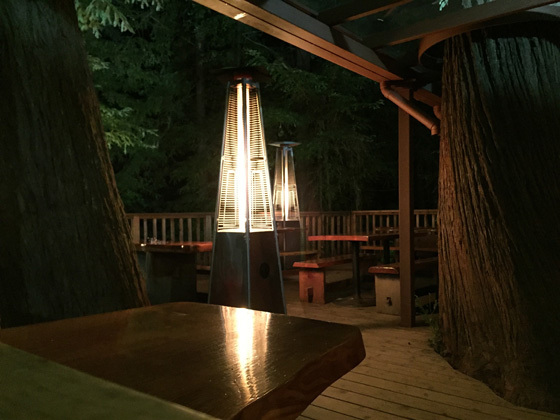 Heaters placed throughout the outdoor patio for your comfort. Back deck lounge with a Ping Pong table. Restaurant by day, bandstand by night. Group tables for your enjoyment while enjoying your cocktails, lunch, big screen tv sports, checking your email on your laptop with our free wifi, or just relaxing and reading a book from the book exchange. We are dog friendly and allow dogs on the restaurant deck. We allow pets in the Campground, RV camping, and the Tent Cabins. We ask you leave your pets at home when you are staying in the Motel, Cabins and Adventure Tents. Please keep your pet on a leash at all times and your pets should not be left unattended. 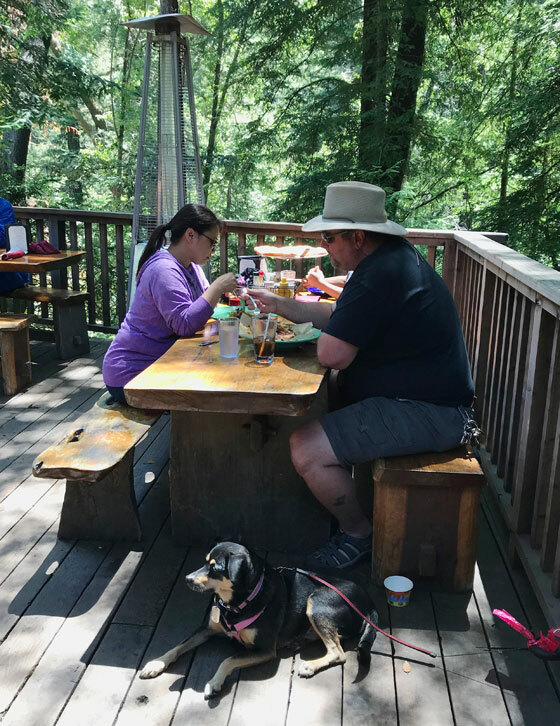 You can even bring your pet to the grill, as long as you eat on the back deck.